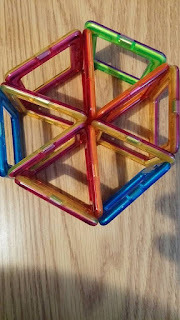 We had the opportunity to facilitate a review for the Magformers Construction Set. The Magformers have been a super big hit in our home. Our children and grandchildren have had loads of fun creating all kinds of great structures. I think these are played with at least three or four times a day. I love watching their imaginations taking over. The Magformers are recommended for children ages 3+ due to choking hazard. At our house, we have decided the shapes are large enough that all age play is safe. Magformers are award-winning construction sets of colorful, sturdy, durable magnetic plastic shapes that are used to create amazing 3D structures, including geometric shapes, buildings and moving cars. These come in a variety of different shapes and sizes, squares, triangles, pentagon, rectangle and more. The pieces are strong and holds together anything your child decides to create. Each set comes with a booklet that shows diagrams and pictures of various constructions from funky shapes to cars. Our grandson is four and he has been learning his shapes. Everyday he tells me the shape of his toast or reminds me the remote control is a rectangle. This construction set came in perfect time. There are shapes he knows and now some new ones in the set he's learning about. He loves building with them, as do the other kids. Even the baby gets in on the fun and stacks them. 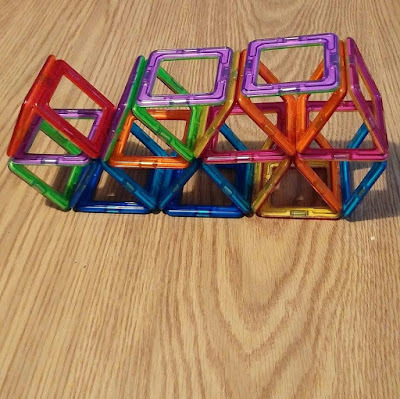 The Magformers are definitely durable, and I can't believe how strong the magnets are. They secure into place when snapped together and no matter how they are flipped they never reject each other at the edges. It is easy for us to see why Magformers are so well loved by kids, parents and educators. They have won many awards. In 2007, they received the Openheim Toy Portfolio Platinum Award and in 2009 they were awarded the BEST TOY FOR KIDS. Also in 2010, an award from Astra - American Specialty Toy Retailing Association. Magformers encourage children to use their imaginations. Their durable, fun and are educational. That makes them a toy worth keeping around in our household. The possibilities with these are endless, and I love watching the kids create their many masterpieces. The bright colors attract their attention and after creating something great they are proud of themselves. We love these and think you and your child will too! You can connect via Facebook , @MAGFORMERSLLC , Instagram , G+ , Pinterest , You Tube , Website . Thank-you for your kind words, Michelle. Finally toys that encourage children to use their imagination and to be creative. So many toys now a days are either computer based or the content is not appropriate for the suggested age on the toys. I think I will get some for my sisters kids Christmas. I like these,they look fun! These look fun for kids and adults. Easy clean up. I have a couple grandchildren that just love creating things. They will try and build just about anything with whatever they can find. They are pretty creative to. They would have so much fun with these. This looks like a great toy to play with, I know my grandson would have fun with them. I'm all for any toy that is not an electronic. What a great toy! My grandsons would love playing with this. I love toys that requires building and so do they. My little boy would live these toys. He it'd just starting to learn shapes and colors and this would be a fun way to learn. Rhanks for the great review. What a cool toy! 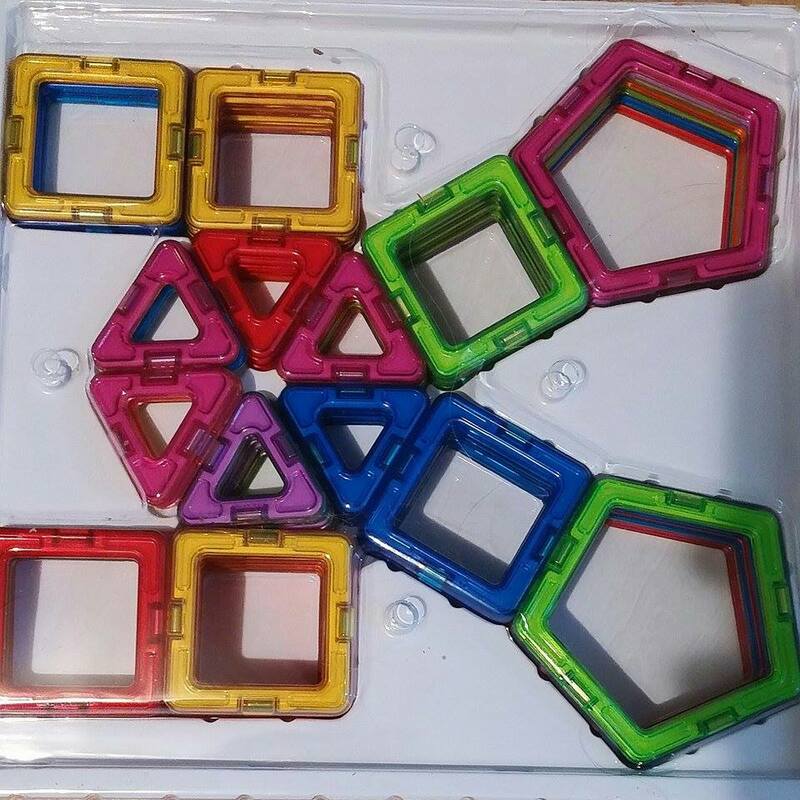 Helps young minds get creative and develop hand and eye coordination . My six year old son would absolutely LOVE to play with this!! Heck, I'd probably even enjoy tinkering around with it too! Thank you for the review. The grandkids would love these. Kinda like puzzles. These would be fun for all ages. Those look so cool! Im sure my kids would love to play with them! I love these toys. They are addictive to play with--the magnetism part. I need to get my son some of these!! Those look really cool! I bet my nephews would love playing with them. Construction toys are the best for imagination! This looks like so much fun we would build it with the kids they would love it. all over the place, I love that smaller children can play as well as older children Ideal Christmas gift this would make.. I like these, my little ones are always building things and the oldest wants to be an engineer. They sure do look strong and durable. I always love toys that encourage creative play. I have always thought it was better for kids to use their imaginaation, to be independeent and come up with theirr own ideas. I like the bright colors ad thee possibiities of these. I have to llok into this for my nephew! I just won a set of these last month. My grand kids are gonna love them! These look like fun, my son would enjoy them. I would've loved them when I was younger. My youngest nephew would really enjoy these. They look like a lot of fun to me!